This is the fourth post about Phayartaung, in Myanmar, a place where smiles come easily and life has a especial taste, of old days, fresh air and love. Phayartaung Monastery is the heart of the village with the same name, a calm fishing village that lies on the banks of the Samkar lake (sometimes referred as Sakar, Sagar…). Here, the days pass slowly and are calm, just like the waters of the lake. Walking around Phayartaung village is like a travel in time. The place is calm, you can hear the sounds of birds and children playing around and hiding from any foreign face. Sometimes these shy faces would come and greet you with a big warm smile. The days begin with the alms round, when novices and monks walk barefoot throughout the village with their alms bowls collecting rice. When they hear the bells, they go to the front of their houses to wait for them. Everyday. In one of the corners a small weaving factory catches my attention. They are using bright colourful threads in some rustic machinery powered by their feet. Three young women are concentrated in their work and another heavily pregnant is arranging the threads. They are going to become beautiful bags – that are like a signature of Myanmar. Few meters ahead, children are playing volleyball by the lake in an improvised court. They cheer each other every time the balls hits the ground. Not far from there is the communal shower place, one for girls, another for the boys. There are big water containers where the villagers come to wash up in the end of the day. They come with their buckets filled with what they need and go on their routine cheerfully. But they don’t take all their clothing off. They keep a longyi on to cover most of the body. Throughout the village, few small shops sell the basics for daily necessities. And food stalls appear now and then, mostly selling snacks for the kids and teachers in the school. The main activity in the village is the 5-day market. As the name suggests, it happens every 5 day, by the lake. On the other days the market is on other villages nearby. The sellers begin to arrive on the day before from the lake. Ox cars are the main transport from the canoes to the market area. The market begins early, around 7am. More than a shopping place, this is a social event. People come for breakfast, chat and, of course, buy groceries, clothing, kitchen, house utensils and much more. In the market you can try Shan noodles and buy chickpeas tofu – a delicacy widely available in Myanmar. It is very different from the soya tofu and a must try! The vendors with some sort of turban on their heads are from the Pa’o ethnicity. These are the people from the mountains. They are the second largest ethnic group in the Shan state and easily recognized by their colourful turbans. Women often wear navy blue or black vests. A quiet spot by the lake. And just by the market place lies the only hotel in Phayartaung. 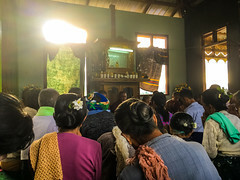 The Inle Sanctuary Phayartaung is run by Aung Min, who employs former students from the local school. The place is hidden gem, it is totally solar powered and sources its food and services from the community and gives a percentage of its profits to the monastery. This a great way to stay in a place that values sustainability in every aspect. 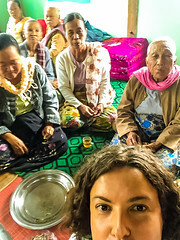 Aung Min is a local and knows everything around and can provide tailored and very authentic tours. One day, I was at the Inle Lake Sanctuary having an amazing lunch with Aung Min, the cook there is a talented young man, former student of Phayartaung Monastery, who prepares beautiful dishes. During the meal, a man came and gave a candle to Aung Min. I didn’t get what was happening, but then Aung Min explained that this was an invitation for the open-house of the man’s son. Back in the days, in rural areas, it was difficult to have access to papers, imagine cards. So people used candles, or leaves as an invitation. This tradition remains until today in many places. And I was kindly invited to go to the party. Yeah!! The candle is the key! Tea time with the women. Prayers to protect the new house. There is space for everybody! Selfie time with the new friends. This community is like a great family and every now and then they celebrate their achievements together. Whenever a villager builds a new house, for example, when a couple gets married, they will invite all neighbours to feast and pray in the house. However, this is not your usual open-house party. First, it begins early, like 6 or 7am. But since the monastery wakes up at 4:30am, so not that early for Phayartaung standards. And there is a lot of people! So, arriving at my first open-house in Phayartaung, I sat with the women and children to have tea. The only common language we shared were mimics or smiles – and this was more than enough. Upstairs monks were praying and blessing the new house. After the blessings, time to feast!!! Low tables were places all over the floor downstairs and upstairs and a lot of food kept coming in. So delicious (with many vegetarian options)! I hung around until 9 or 10am. But people kept coming and joining in. Ah, there is music on loud speakers, so the whole village knows there is something going on. I had a second open-house party. 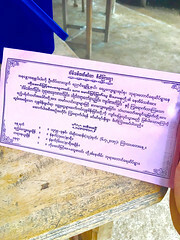 This time, they didn’t use a candle, but they printed an invitation in the monastery. I was heading down the hill, where the monastery is, and on my way I found some friends I’ve made in the previous party, so they showed me the way. When I arrived the monks were praying, so this time I went upstairs to participate in the ceremony. This house was full. Every bit of floor was taken. I met more old friends who kindly invited to eat with them after the prayers. We laughed, took some silly selfies and, now and then, somebody would translate something for us. One of them wanted to swap shirts with me. They were so beautiful and kind. The type of kindness that comes easily from the heart and it is rare to find in this mad world sometimes. Around Phayartaung there are some beautiful spots to be visited by foot, boat, car or motorbike. The village is surrounded by rice fields. Walking through them is like being a sea of green. This path we took, lead us to a (really) hot-spring. And, not far from it, there is an old pagoda on the top of a hill, from where one have amazing views. It is also possible visit some not tourist spots with a car and moto. But this is for another post. Note: If you want to know more about Phomgyi life, Phayartaung monastery, Myanmar struggles, tales of spies involving monks and alms bowls, words of enlightenment and get to know a story of beautiful encounters that transcend religion and languages, I encourage you to read Children of the Revolution, beautifully written by Feroze Dada. And what is better, the profits from the book help the children of the monastery. Quotes and data from: Dada, Feroze 2012. Children of the Revolution. Kindle edition. For more pictures of Phayartaung Monastery check my album on Flickr.